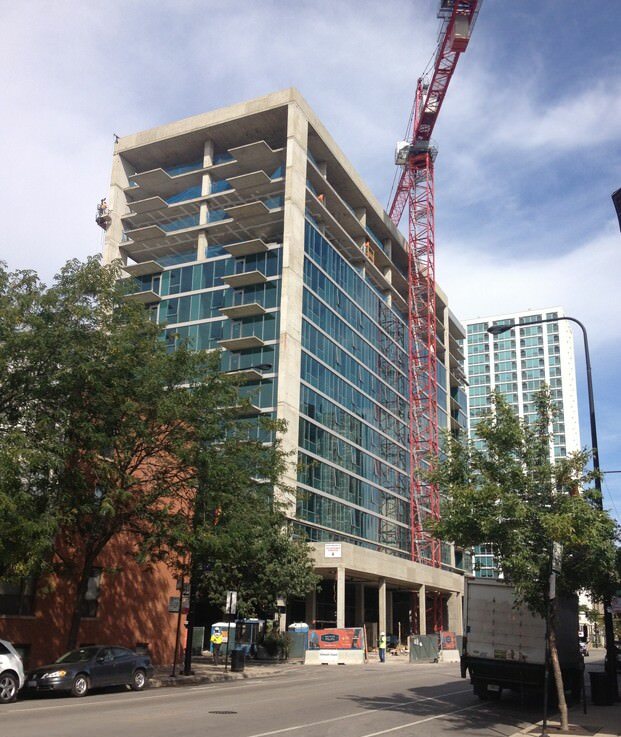 Halsted Flats, a multi-use residential building under construction at 3740 N. Halsted Street in Chicago’s Lakeview neighborhood, has topped out at 15 stories. Company executives from the development partnership, JDL Development and Harlem-Irving Properties, architecture firm HPA, and general contractor Lend Lease, were joined by Alderman James Cappelman at a topping out celebration on September 20, 2013. The concrete-framed structure features two residential towers that arise from a podium that contains structured parking and 10,900 SF of ground-floor commercial space. The full-amenity building will feature a fitness center, clubroom, and a swimming pool and outdoor lounge atop the 20,000 SF green roof. The project is targeting LEED Silver certification. Located at the intersection of Halsted and Broadway Streets, the transit-oriented development has ready access to public bus and rail transportation. Floor-to-ceiling windows offer views of Lake Michigan and Wrigley Field.